Note: This review contains some major PLOT SPOILERS so readers beware. Plot Synopsis: Recently released from prison, Jimmy (JACK REYNOR) hopes to reconnect with his younger adopted brother, Eli (MYLES TRUITT), and estranged father (DENNIS QUAID). But after a run-in with a vengeful criminal (JAMES FRANCO), Jimmy and Eli become fugitives with one hope for survival: a metallic box from another dimension, discovered by Eli, transforming into a super-powered weapon and leads Eli to discover his true identity. 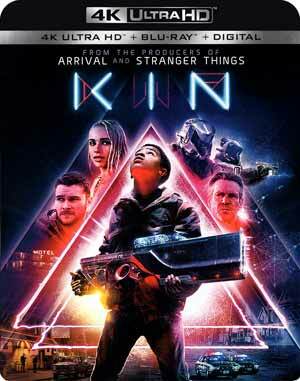 Quick Hit Review: Kin is a movie that for one reason or another, perhaps due that it’s from the producers of Stranger Things with a similar look, at least in regards to the promotional material with its neon colors and poster designs. The movie itself? It was alright, I guess. Kin is the kind of movie that you watch, be slightly entertained but move on and forget about it a few days later. The film is a mish-mash of a family crime-drama with science fiction and although on their own were fine, the two genres never quite gelled and then there’s a finale that sequel baits for a sequel that, considering its lackluster box office (taking in a mere $10 million worldwide), one that we are unlikely to see (although I guess I wouldn’t count out Netflix to do some sort of TV series). On the positive side, though, the performances were decent. I liked the interactions between Jack Reynor and the young Myles Truitt marking his feature film debut (and has since landed a recurring role on Black Lightning), and for a new talent, holds his own quite well. James Franco, as he has done for the past few years, eats it up as the villain, riding the line between being scary and chewing the scenery. Zoe Kravitz doesn’t get a lot of screen time, probably coming into the picture about 15-minutes in and exiting at the beginning of the third act, had a few nice scenes and does well considering her limited, but still effective role. Last, Dennis Quaid has a small but important part as the stern by loving father, and he also has a heartfelt scene with Truitt before his tragic departure. Based upon their own short film Bag Man, brothers Jonathan & Josh Baker direct Kin with some diligence and if not for the haphazard plot, with the screenplay written by Daniel Casey (upcoming Fast & Furious 9), that didn’t connect all that well, not to mention the aforementioned finale, might’ve made for a fun, if not breezy, sci-fi/thriller and instead it is on the forgettable side. This release comes with a glossy slip cover and inside a Digital HD redemption code. For a movie that didn’t exactly set the world on fire at the box office, Lionsgate did load it with some features, all shown in High-Definition and are available on both the 4K UHD and Blu-ray discs. Thicker Than Water: The Making of Kin (1:51:25) – This 8-part featurette delves into the inspiration, casting, locations, visual effects and more with interviews by members of both the cast and crew, including the Baker Brothers, Michael B. Jordan (producer/actor), Jack Reynor, James Franco, Myles Truitt, Zoe Kravitz, Dennis Quaid and many more. Enhanced Visual FX Breakdown (13:52) – Compositing Supervisor Keegen Douglas guides viewers through the VFX in the film. Bag Man Original Short (14:39) is the film that Kin was based from and includes an optional commentary with the Baker Brothers. Deleted Scenes (11:52) has an introduction with the film editor and there are 11 scenes that didn’t make it into the cut. Not bad, but certainly redundant and unnecessary. Learned Behavior: Special Features at Work (59:14) is a really unusual featurette, a roundtable conversation about features and participants include Jonathan and Josh Baker, Kevin Smith, Dan Trachtenberg, Daniel Kwan, Daniel Scheinert and Laurent Bouzerau (Special Features Producer). Absolutely fascinating to hear from these filmmakers discuss the importance special features had on their lives and careers. Kin comes to 4K UHD presented with a 2.39 widescreen aspect ratio and a 2160p high-definition transfer (1080p for the included Blu-ray copy). Not exactly a brilliant presentation, the picture still looks pretty good in 4K with a nice sharpness on all detail and colors fairly bright, though not entirely sure how much the HDR aided as I really didn’t discern that much of a difference compared to the Blu-ray, however the there is certainly a moderate difference in terms of the detail. Black levels were generally stark without appearing crushed and you can still distinguish details within those darker scenes. Both the 4K and Blu-ray discs come equipped with a DTS: X track which sounds pretty damn good, for the most part. Although I won’t say this is the most awe-inspiring track or anything, it’s still resoundingly solid, with great dialogue coming primarily coming from the center channel with nice levels via the fronts and rear speakers as well. This is for the most part a quiet movie with a few action sequences thrown in to give it some added depth. Overall, Kin is a nice little drama-science fiction flick but is a victim of a bit of overreaction based on its initial trailer. That said, it is enjoyable enough even when you get a finale that, as some have pointed out, felt like the end of the pilot episode, where it unfortunately sequel-baits, though given today’s climate of entertainment, could see new life through streaming.